Convention Fever is in the Air! 53 days remain until Close To My Heart invades Dallas, TX in celebration of our annual National Convention. Initial plans are underway for team fun and we are going to party Texas-style! You know the saying..."Everything's BIGGER in Texas!" In reflecting back over Convention 2011, held at the Disneyland Hotel (Anaheim, CA), I found myself browsing through last year's Convention CD. In it, I was amazed to find several photos of me and my team members. Too fun! Me as part of the presentation panel for a break-out class. Here I am at the Director's Dinner. Our Mickey ears were a gift and served as our place cards. My first downline, and Director, Joy, at the Director's Dinner. For those of you joining us this year - whether you've attended before or not - get ready for the biggest celebration ever as we gather at the Anatole Hotel, Dallas! I can't wait to par-tay with my team members and Consultants friends! Dallas...HERE WE COME! 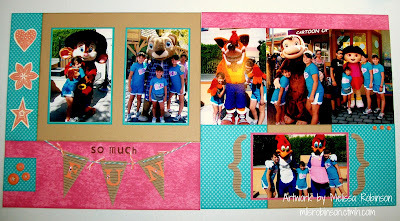 I posted a video just a couple of days ago about our online scrapbooking program Studio J! That prompted me to get in my account last night and purchase some of the AWESOME layouts I had already made using the program, but hadn't yet purchased. Feel free to enlarge the photo by clicking on it so you can read the journaling. 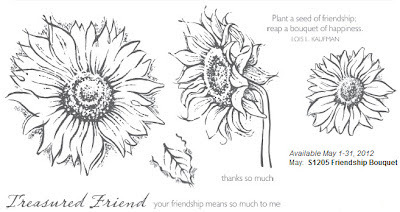 I purchased 11 layouts at just $6.50 each and received 11 FREE 12x12 page protectors! Who can make a handmade layout for that price, not to mention not having a mess in my scrap room when I was finished?! This phenomenal price is exclusive to those who hold Memberships but there are some options for just testing the waters and seeing how you like the program before taking the plunge. I am happy to provide you with some additional information regarding these options. I used some fun and easy techniques on this layout including being able to put my titles directly onto the base using font colors besides black! How fun is that?! Just thought I'd share one of my Studio J creations with you. Check out Studio J by clicking here. Happy Friday! 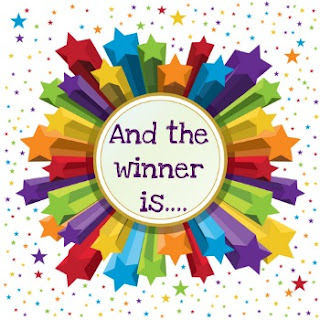 As promised on my May 2nd post, and as noted in my May Newsletter, I am giving away $25 worth of FREE products - winner's choice (select product items as noted on page 2 under Host Rewards). Teri, I appreciate you being an avid follower of me and my Close To My Heart business. I am thankful CTMH brought us together and is one thing that keeps us together. Please contact me via email before the end of the month, May 31st, with your desired items. Please also include your mailing address. Many thanks to the other participants who are also avid supporters. I appreciate it more than you know. It's not too late to do any of the above if you are still interested in following me and all I have to share regarding papercrafting. If you have any questions, just contact me and I am happy to guide you in the right direction. Gotta love Close To My Heart as they continue to improve our online scrapbooking program, Studio J! Scrapbooking can't get any easier - and be this enjoyable. 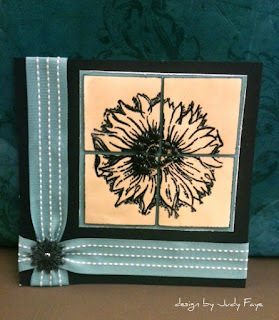 So...you might think you can't let go of the paper and embellishments?! Who says you have to? I do a little of both, more hand-to-paper, but Studio J provides a great and feasible option for busy scrappers, for those who have little ones and find getting alone-time slim to none, those who have limited space in which to work... In fact, with Studio J you can grab your laptop and lay in bed while you scrap! How awesome is that? If you haven't given Studio J a try, what are you waiting for?! It's FREE! Click here to create a FREE account and start playing around with it. You have nothing to lose...and possibly tons to gain! This video shows you a little of the in and outs of the online program as well as some fun things you can do with it! How would you like to have a certain pattern of paper in a variety of colors without paying for each sheet? Well...now you can with Studio J! If you have any questions, please contact me. Feel free to leave a comment letting me know what you think of Studio J! I would love to schedule a time with you when I can show you - in person, or virtually - how simple and fun it is to use Studio J! Just let me know when is a good time for you! Everyone says they have the best mother and I guess all can be justified. I know mine can. My Mom has been many things to me over the years. She has taught me how to act and be respected as a woman. I have lived an easy life, blessed by a Mother (and Father) who raised me with Godly principles, teaching me right from wrong and instilling in me that I could achieve anything I set my mind to. Striving to please them, while fulfilling a lifestyle I was proud of, I have been blessed with a successful life full of love and prosperity. I know I couldn't have gotten to where I am without them and today I honor my Mom. Mom, I love you with all my heart. I'm thankful that I am filled with many of your traits, including the crafty one. 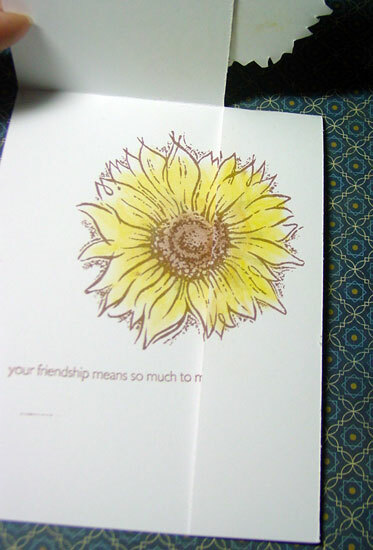 I'm grateful that similarity has brought us closer together over the years as we can have fun and creative chats over the phone and share in unique and special moments at scrapbooking-related events. And while distance separates us, my love for you never waivers nor do I forget where I came from. Thanks for opening up my mind to a world of possibilities and for being my biggest cheerleader as I go through life. God could have given me any Mom...but I am glad he gave me YOU! I love you! I am also thankful to have a wonderful mother-in-love in Willie Mae. I am thankful for her raising up a Godly man. I couldn't have found a better husband, in all regards and I know she is highly responsible for the man he is today. Happy Mother's Day to all you Mom's out there. I know your responsibility on this earth is a challenging one and not recognized nearly enough. We extended our stay in California last summer at the conclusion of the Close To My Heart National Convention. One of the days we visited Universal Studios where we encountered many cartoon characters and took the opportunity to pose for pictures. My niece and her siblings took these fun pictures. My niece is the one posing with Fievel (mouse in picture furthest to the left). She was so excited to see him and you can tell by her warm embrace. You can pick her out in the other photos. These photos bring back great memories of good times! I know, I know... I'm wearing this paper packet out but can you believe I have only used half a paper packet for all that I have created (plus some cardstock, of course) and I am not done yet?! And, have no fear. I have another paper packet where this one came from and I plan on ordering a few more before the month's end. LOL I love the bright bold colors of this paper packet! 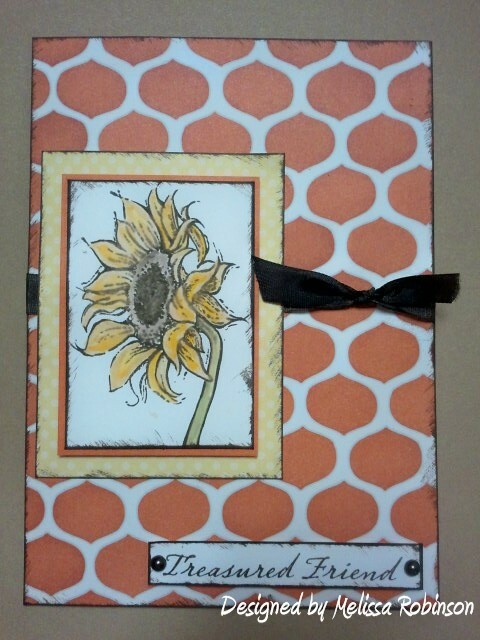 I used the "Crafted with Love" stamp set for the focal point of this card. 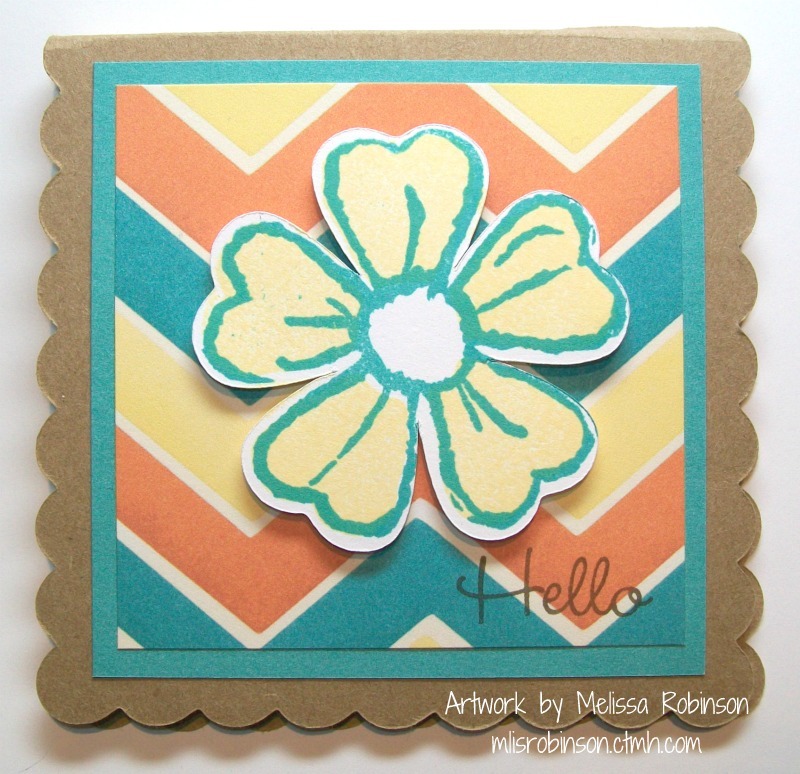 The simplicity of a card with beautiful papers and a sweet message are what please me most. I had fun making this card this past weekend using...yes, you guessed it! The "Dotty for You" paper packet. Have I not yet convinced you that you need a package (or two) of your own? 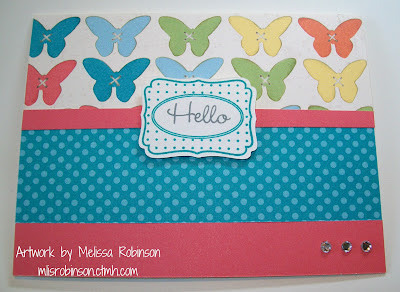 This time I decided to incorporate the butterfly paper from this packet. 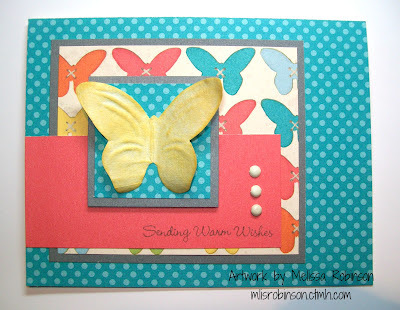 To highlight the butterfly, I sponged a Just Blooms Flutter Paper Shape (one of the big butterflies) in Buttercup ink. A few Colonial White small brads later and a sentiment... I thought it came together well. I am fresh and rejuvenated today after spending the weekend croppin' with my scrapbooking friends and team members in celebration of National Scrapbook Day. We gathered at my friend Angie's retreat and on Saturday...there were 20 of us scrappin'! It was a great time and just what I needed. 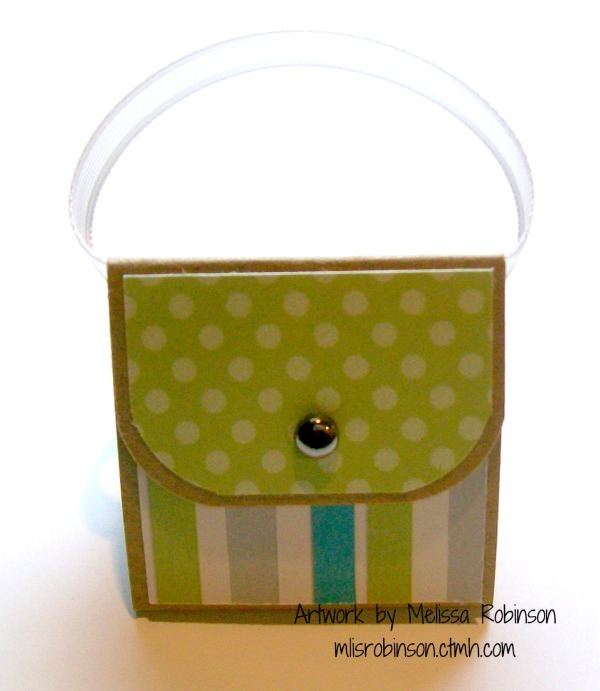 This is a sticky note holder made with the Cricut, using our exclusive Art Philosophy cartridge. 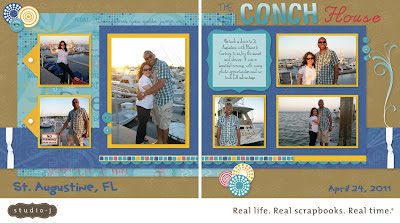 I followed the directions from my friend Pamela O'Connor's blog. It was super easy, came together super quick and is purposeful. Gotta love when all those things come together for a fun treat! Upon arrival, each guest had this place card sitting at their spot. I should have taken a side view photo of it as there are three Hershey's kisses housed inside. This idea came from a retreat favor made by a team adoptee, Wanda Cincar. And lastly...this cute little purse, which holds a Hershey's Nugget, is perfect for this time of the year, especially with Mother's Day around the corner. It would make a cute favor for a tea, baby shower, etc. I believe I first saw this made by my friend, Debi McBain, and I have created it a couple of times since. 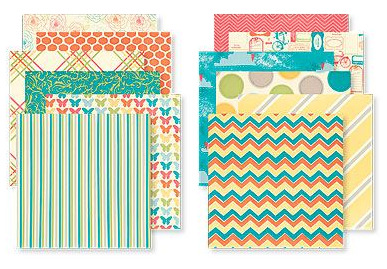 All of these items were made using our May-exclusive "Dotty for You" paper packet (only available through the end of the month). Everyone seemed to love their goodies and I am thankful. I love making things that put a smile on the faces of those who receive them. I had a fabulous weekend and am thankful to Angie for allowing us to invade the house! 1) Click here and create a secure account. Your information will automatically be added to my database. 2) Leave a comment on this post. 3) Email me directly at mlisrobinson@yahoo.com. If this is your first time to visit my blog...take a few minutes to check it out - including the helpful links on the right and fun posts in the main body of the blog. I have enjoyed maintaining my blog over the last couple of years, providing a little insight into my personal life and sharing my artwork. Receive two tickets when you subscribe to my blog. (If you are already subscribed, please state so.) It is easy to subscribe. Just scroll down on the right and enter your email into the subscription box. Upon doing so there will be a pop-up window which appears. Enter the code into the box, to help avoid spam. THEN...you'll need to also confirm subscription by clicking on the link emailed to you. It's really simple and just takes a few clicks. By doing so you will receive an email in your inbox whenever I post - usually a few times a week - and this will ensure you are kept up-to-date with promotions and events. Receive one ticket if you follow me through my Business Facebook Page. For me to know that you have done so, make a comment through there after "liking" it. 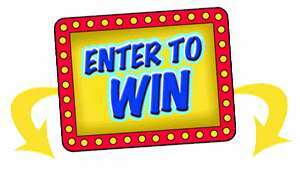 With the above, you have the opportunity to be entered into the drawing four times. I will use Random.org to generate the winning number. Numbers will be assigned as responses are received. If you have any questions, let me know. The contest ends at the end of the day May 15th and the winner will be recognized on the May 17th post. Thanks for participating and letting me know that my media efforts are reaching you. 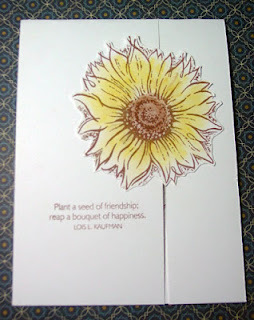 May SOTM - "Friendship Bouquet"
Some of my earlier stamping friends know that sunflowers are not one of my favorite flowers. I don't know why, but they aren't and never have been. With that being said, I wasn't too sure about this stamp set (contains 8 images) but I think I have since changed my mind otherwise. And...you guessed it! I had to incorporate the Dotty for You paper packet in my creation! Using the "sideways" sunflower as my focal point on this 5" x 7" card, I used the Waterbrush Pen - love it for coloring in images - and Sunflower, Creme Brulee' and Cocoa inks to color in the image. Applying some Cocoa ink on our Color-Ready Ribbon (love this stuff too) with a Sponge Dauber (another favorite), I was able to make my ribbon coordinate with my color scheme. A special message and two cocoa brads did the trick! I had a good time creating with this stamp set and might even create some more items with it. Gotta love working with beautiful stamp sets that open your mind to possibilities. 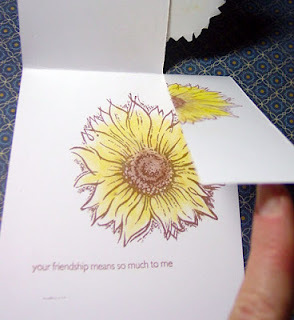 Below you will find some other fabulous artwork ideas using this stamp set as shared by some of my dearest Consultant friends. Please take a moment to leave a comment if you so see fit.